The mission of Nick’s Fight to be Healed Foundation (NFTBHF) is to support pediatric cancer patients as well as serve the young adult cancer community. We strive to improve quality of life by promoting well-being, reducing stress within the entire family, and providing resources to help children with cancer lead fun and fulfilling lives. NFTBHF is a 501 (c) (3) non-profit organization. Dedicated volunteers run this foundation without any administrative fees. Nicholas (Nick) Luke Cammarata was a charismatic 12-year-old boy who loved playing video games, reading, building Legos, swimming, and martial arts. Nick’s enthusiasm for life and bright smile was contagious. He was compassionate, loyal, and funny, bringing laughter and joy to anyone that connected with him. On July 4, 2008, Nick was diagnosed with Acute Lymphoblastic Leukemia (ALL). After a very rough and short four-month journey, Nick passed away from the complications of his disease and chemotherapy on October 26, 2008. He had just turned 13. Throughout his short life, Nick lived fully. He loved children. He had trained to be a babysitter and was preparing to be a lifeguard and swim instructor. His goal was to be a technology teacher, and he would have been a fabulous one. When his classmates learned of his passing, many shared stories of how Nick protected them, helped them when needed, and told jokes that always made them smile. Nick will be remembered because of the joy he brought to others. NFTBHF brings his compassion and belief that ‘Nothing is Impossible’ to every child who is battling cancer. Through this foundation, his spirit lives on. Luke Romano was a 17-year-old senior at Shenendehowa High School. Luke's zest for life, charismatic personality, infectious smile, and fearless determination to beat cancer won the hearts of family, friends and complete strangers. During his life journey, he inspired many because of his perseverance, generosity and courage. He was determined to never let the cancer control his life. He valued family and friends and lived every day to the fullest. By his nature, Luke was a competitor and loved all sports. Prior to bone marrow transplant in 2007, Luke was introduced to the sport of thoroughbred horse racing by Jay and Colleen Cummings. Soon all aspects of the horse racing industry became Luke's passion. He was taken under the wing of Colleen's parents, Colum and Jackie O'Brien, who are thoroughbred trainers at Belmont and Saratoga. Luke loved spending mornings at Colum's barn and being on the backside of the track. His dream was to make a career in the equine industry. During Luke's courageous, seven year battle, our family was greatly supported the generosity of Shenendehowa CSD and Niskayuna CSD staff, Clifton Park community, friends and family. In partnership with Nick’s Fight to be Healed Foundation, we have develop three special ways to remember Luke: Luke's Legacy Pillow, Lukestrong Olympics, and Luke's Legacy Scholarship. Luke received a soft down pillow from his Aunt Lisa and Uncle Paul during the first week he was diagnosed. Luke loved his pillow and brought it with him to every appointment. His pillow was like his teddy bear. We provide a Luke's Legacy pillow to enhance the Fight to be Healed Comfort Bag to provide teens comfort and courage through a new diagnosis. The Lukestrong Olympics has been a memorable event at Shenendehowa High School East for the past 8 yrs. The LukeStrong Olympics was conceived by Luke's classmates and has had been extremely successful with outstanding participation from the Shen students and community. Teams compete through a series of events to honor gold, silver and bronze winners. All proceeds go to support the Hope Bag project and families affected by childhood cancer. Over each of the past 7 years, we have awarded a $1,000 Luke's Legacy Scholarship to a high school senior who attends Niskayuna High School and to a senior who attends Shenendehowa High School. The recipients of this scholarship are interested in furthering their education at a two or four year institution in the field of Equine or Veterinary Science. Our family is comforted by the ability to give back by collaborating with Albany Medical Center's Melodies Center, school districts, community businesses and especially Nick’s Fight to be Healed Foundation. Many people have asked where the idea for our logo and slogan originated. Nick loved all things medieval; dragons, knights and castles to name a few. He read fantasy and especially enjoyed reading books on King Arthur. The dragon is a wyvern, a legendary winged creature with two legs and a barbed tail often found in medieval heraldry, and came from one of Nick's dragon books. Luke, Nick's dad, thought of the sword and shield as it matched the memorial he had placed at Nick's site. Nick chose the red and black colors and the ‘Fight to be Healed’ slogan while friends and family were raising money to help with his medical bills. Together, they represent the spirit of Nick that we hope will shine through and help children defend themselves against cancer. The tag line is just fun and we wanted a cartoon approach since Nick was often called a cartoon character. Starting from a young age, Nick always had his thumbs up in every picture taken. So even in the midst of tragedy, we want hope and positive energy to shine through. Humor and laughter have always been a large part of our lives so ‘Healing Kids by Having Fun’ is what Nick would wish for any child fighting cancer. 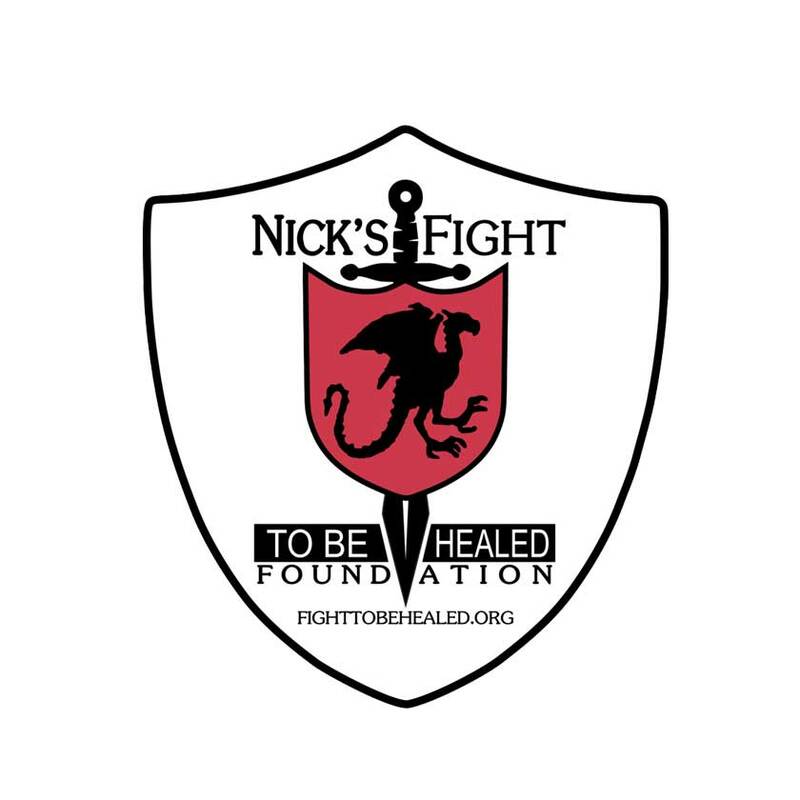 Nick’s Fight to be Healed Foundation (NFTBHF) was formed in 2009 in response to a tragedy. The board of directors consisted of family and friends who needed to make sense of the loss of our son, Nick, after a short and difficult battle with cancer. Some are the original members and, even though board members and volunteers have come and gone, their contribution mattered and made a difference. NFTBHF’s board is a group of compassionate, strong-minded, and hard-working volunteers who have made it their mission to help children battle cancer. We are proud to have them as a part of this organization and appreciate their dedication. The foundation could not exist without them. I am the proud mom of Nick, who passed away at the tender age of 13 and Stephen who is now a thriving young adult. The idea of a foundation formed only three months after losing Nick. I remember my husband telling me that if I was going to do this, I needed to put my heart into it and make it a success. I never want any family to go through what ours has. This is why I have made NFTBHF my mission. Unfortunately, children continue to be diagnosed, but knowing we are here for them adds a degree of comfort that allows parents to focus on their child. What I do keeps Nick’s spirit alive, even as it makes a difference. I am honored that our Melodies Center families let me into their lives. When Nick was in treatment, Janine and I noticed a real gap in support of families of teenage patients. From that, Nick’s Fight to be Healed was born. The overwhelming support and giving we have received from all of you and the reward of giving to those patients in need is why Nick’s Fight is so successful. I have been involved with Nick’s Fight to be Healed since its inception in 2009. During Nick’s brief battle with Leukemia, I witnessed the toll childhood cancer takes on the entire family and extended family. Despite his illness, Nick remained upbeat and positive throughout his journey. Losing such a vital force was absolutely heartbreaking to the entire community. As a result, I am passionate about providing emotional support to children and families through my Flow to Be Healed Yoga sm program. I have personally experienced the benefits yoga has in healing the body, mind and spirit and Nick is my inspiration to share yoga with children and families at all stages of treatment. I firmly believe that yoga is a life skill for young and old; it can be adapted to all abilities and experience levels regardless of limitations; and anyone can access their personal power through movement, breath, connection, community, focus and relaxation. On days where I am not teaching yoga, you will also find me at The Melodies Center visiting patients with my sweet therapy dog, Chloe. When asked to join NFTBH during its foundational year, the answer was easy. Witnessing Nick and his family deal with the varying issues associated with childhood cancer, seeing the impact it had on their family and other families, I knew that Janine and Lucas’s vision for the foundation would have a positive impact on our community. Nick was a part of our family and his passing deeply impacted me and my two sons, both of whom considered Nick a brother. 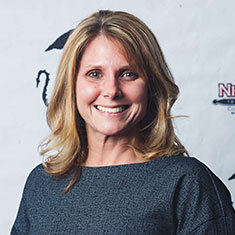 My primary role in the foundation is to serve as Janine’s right hand person in organizing our largest annual fundraiser, Nick’s Run to be Healed. Hearing the stories of families whose lives have been positively impacted by the involvement of the foundation always brings a smile to my heart. I first got involved with Nick’s Fight back in 2017 as a volunteer, and within a year I had officially joined the board. I grew up in Clifton Park, and I’ve always loved the community that helped shape me into the person I am today. After graduating college, I knew I wanted to give back to this community in some way, and Nick’s Fight to be Healed was the perfect organization for me. The events and programs that we hold are always centered around bringing people and families together, which is something I’m very passionate about. Nick’s Fight is always looking for new ways to show the children and their families that there are so many people who care about them and will do anything they can to make their days a little brighter. It’s truly an honor to be a part of a group who has such a huge impact on so many lives. I’ve always tried to make more time in my busy life to volunteer and give back to our community. I’m so passionate about helping people in any way that I can and I’m always asking what I can do to help. In 2016, I joined Nick’s Fight to be Healed Foundation (NFTBHF) to give back to the Cammarata family. Our foundation helps children and families who are fighting or have lost the battle to pediatric cancer. Helping families financially and emotionally makes my heart happy. We’re able to help them in a time of crisis and as it takes just a bit of burden off their shoulders, while making a positive difference in their lives. As the fundraising chairperson, I’m always looking for different events that would help us raise more money to help more families. This foundation, the board members and volunteers, and the families I’ve met along the way have filled a void in my life! I was introduced to the Cammarata Family in 2015 through Clifton Park youth sports and was inspired by their generosity of spirit and willingness to make our community a better place. Asking the question, “how can I help YOU?” led me to be a part of the Nick’s Fight to be Healed Foundation. Volunteering has always been a big part of my adult life and easing the burden of pediatric cancer patients and their families has been very rewarding. Previously, I worked with non-profit organizations that provided respite and care to families who had children with life threatening illnesses. The burden that these families face on a daily basis can be overwhelming and exhausting. Knowing that I’m part of an organization that lifts spirits, provides financial and emotional relief, and is truly able to connect with families that are going through unimaginably difficult circumstances, has been a humbling experience The NFTBH Foundation provides support in so many ways and I’m happy to have a small hand in making life just a little bit better for those kids and families that are facing life after a pediatric cancer diagnosis. Amtrak can provide a discount for customers who are traveling on Amtrak Empire Service Trains within New York State only, for the purpose of receiving treatments for a life-threatening illness. This discount can only be obtained through affiliation with Nick’s Fight or other participating foundations.